Bridal Fabrics offers an exciting range of lace, both in bridal and colours, polyester and silk fabrics, lace trims/appliques and crystal embellishments. We source worldwide but also weave some of our fabrics in house in our own weaving mill in Darwen, Lancashire. All our products are stocked and we supply with no minimum quantity requirement. Our experienced team of sales staff will be only too glad to help you with any queries you may have. 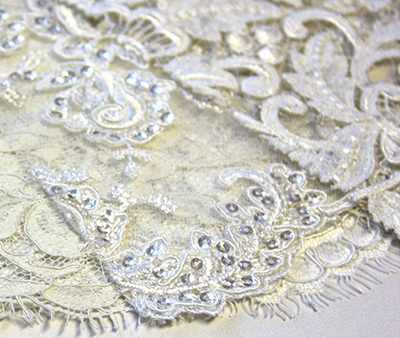 We are particularly proud of our range of bridal laces and crystal appliques.